Racing is scheduled to resume at Santa Anita on Thursday. Following the 23rd horse death at Santa Anita Park, Sen. Dianne Feinstein Tuesday called on the California Horse Racing Board to suspend all racing at the track, and hours later the board scheduled a special meeting to consider relocating races to other tracks. Feinstein, D-Calif., sent a letter to the CHRB saying racing should be suspended at the Arcadia track "until the cause or causes of these deaths can be fully investigated." "I also ask for more information about what the California Horse Racing Board is doing to both investigate this matter and address some of the concerns that these incidents have rightly raised," Feinstein wrote. On Tuesday afternoon, the CHRB announced a special meeting for April 12 -- providing the required 10 days of public notice -- to discuss "possible reallocation of race dates granted to the Los Angeles Turf Club at Santa Anita Park Race Track." No further details were immediately provided. There was no immediate comment from Santa Anita officials. However, there won't be any racing on the hillside turf course, where the injury leading to the most recent death occurred, racing board chairman Chuck Winner told the Daily Racing Form. Winner said racing on the course would be suspended this week "to evaluate the circumstances" of the recent spill. Two-time Triple Crown-winning trainer Bob Baffert told reporters Tuesday morning during a National Thoroughbred Racing Association conference call that he remains confident about the level of safety at Santa Anita. "If I thought there was a danger out there, I wouldn't even (send) my horses out there so I'm feeling good about what's going on here. But I don't want to jinx myself," said Baffert, who noted that he hasn't had any issues at the track since the racing season began Dec. 26. "We've been under this dark cloud, so hopefully we can move forward," he said. Baffert is expected to have two of his top 3-year-old colts -- Game Winner and Roadster -- in Saturday's Santa Anita Derby. The 23rd horse death at Santa Anita since Dec. 26 occurred Sunday when Arms Runner, a 5-year-old horse, suffered a severe and ultimately fatal injury to his right leg during the Grade 3 San Simeon Stakes on turf, resulting in a two-horse spill. The trailing horse, La Sardane, fell but quickly got back on her feet. Santa Anita had been closed to racing for most of March in response to the spate of horse deaths. Racing had just resumed Friday at the famed Arcadia track, one day after the California Horse Racing Board approved restrictions on certain medications administered to the animals. The CHRB approved previously announced proposals to strictly limit the use of anti-inflammatory medications on horses. It also approved a much-discussed 50 percent reduction in the allowable amount of Lasix, a diuretic that helps prevent horses from hemorrhaging. 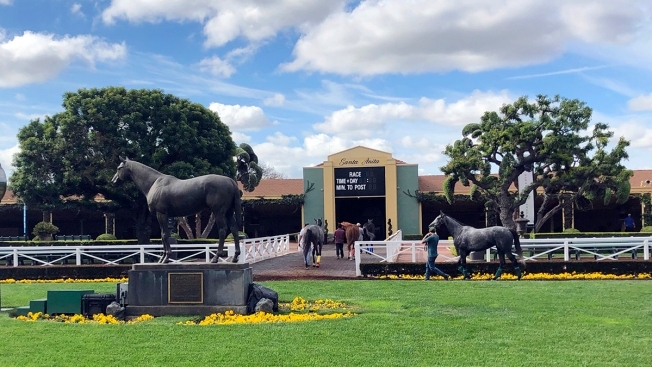 Santa Anita officials had initially proposed a ban on Lasix, but struck a compromise with the Thoroughbred Owners of California and the California Thoroughbred Trainers calling for a 50 percent reduction in allowable dosage. -- A substantial investment by The Stronach Group in diagnostic equipment to aid in the early detection of pre-existing conditions. Those measures, however, did not prevent animal-advocacy groups from protesting the resumption of racing at Santa Anita, who point to the dangers they say are inherent in the sport. Between December and February of the previous year, 10 horses died at Santa Anita, compared with eight in 2016-17 and 14 in 2015-16. The track averaged about 50 deaths per year from 2008-18, according to data from the CHRB. Former track superintendent Dennis Moore and Mick Peterson of Racing Services Testing Lab were brought in to conduct a thorough analysis of the main track, and officials repeatedly said they found no problems.